Yesterday night,I went back to my hometown for the annual reunion dinner,is known as Chú Xī (除夕) or "Eve of the Passing Year." :D My hometown is at Rawang,so it's quite near for me to travel to and fro.. The next morning,we went back to hometown again. The most important date of Chinese New Year is the first day. It is a time when families visit the oldest and most senior members of their extended family, usually their parents, grandparents or great-grandparents. My dad is the only son so we're the only family who was back to Hometown for the first day. It was..urmm..kinda boring XD Usually the second day of Chinese New Year is the day to visit the mom's side. My grandmother started telling me her life stories and she started crying..It's really touching..We've been through really hard life to come to this stage..
Yeah, my parents did have a hard life too before having me. 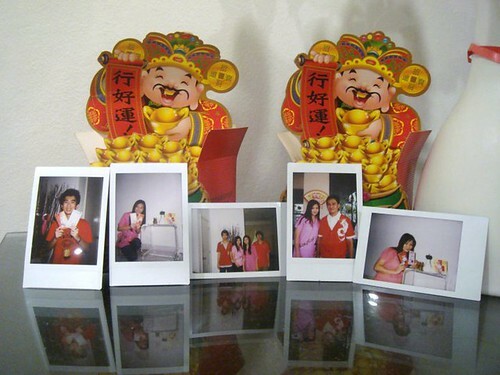 Thanks to them for everything (: Happy CNY, babe!